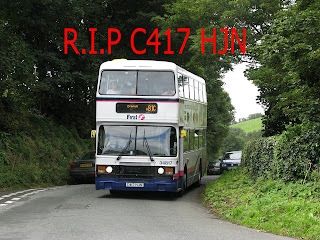 As was thought, C417 HJN, 34817, 4017 has now been withdrawn from the First Devon and Cornwall Fleet. She is to my knowledge now parked up in Plymouth, awaiting the tow I presume. This leaves just 2 Leyland Olympians. The race is on, which will keep going, and which will fall out. Looking at there past 34812 has been more prone to minor breakdowns which she has even demonstrated in recent weeks, 34813 has always been the most reliable of the original 4, though she has a weaker engine that 412. But its anyone's game at the moment. 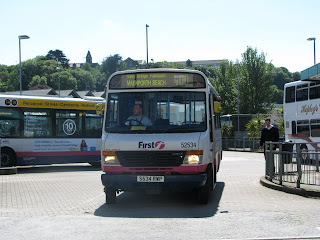 On a brighter note the replacement bus is now in Plymouth. K801 ORL has been spotted by Cuffy on Plymouth duties and therefore it can't be long at all until the ferrylift is fitted and she's in Torpoint, taking up 34817's spot in the depot. Today saw myself take a trip down to Truro for the 3rd time. The day started off along with Jim on the 7:07 down to Cremyll. After disembarking from the 7:30 Cremyll ferry I decided to walk into Plymouth to 'save time'. I estimated the walk as 10 minutes though it turned out more like 20! leaving my pushed for time when I finally got on the 1A at 8:00am. 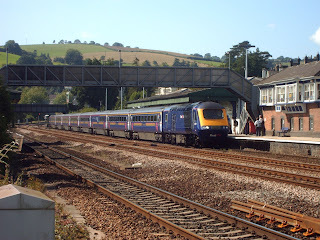 Though the connection was smooth and I was soon on my way to Truro on the 08:20, though until Liskeard I had to stand on the packed class 150/3. On reaching Truro it was a very good connection down into the bus station on a Volvo B7. 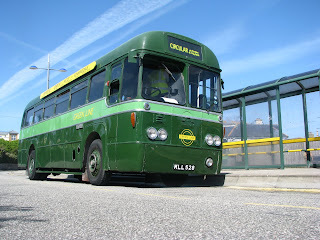 Sadly though by a matter of minutes I missed Leyland Olympian A754 VAF going out on service. Therefore I did a bit of spotting for a while. 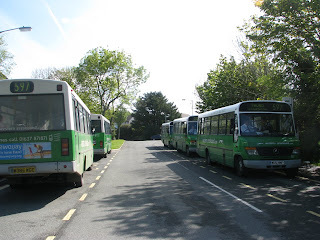 Was quite interesting to see how many ex-Plymouth buses have now migrated there. Mercedes Varios 52534 and 52535 are the latest Vario additions. 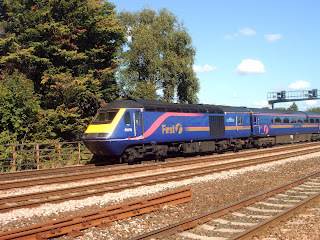 52534 had spent some time at Torpoint before this. There was also the 3 Marshall Varios, 52596/7/8 all being used. 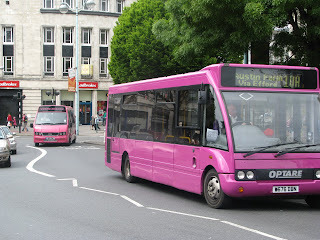 There were also several of the P reg Dennis Darts that were originally bought to run the 14 and 18 that the B7s now run. There was also Hopeley's Volvo Olympian on hand, along with some Royal Olympians from FDC, along with an array of Solos or Darts. Not forgeting the 2 D reg Volvo Citybus' aswell. 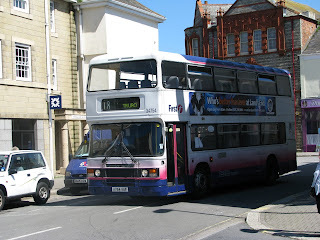 After this time A754 VAF had returned from her trip to Camborne and I jumped at the opotunity. Unusually, she was being used on the 18 to Penzance! Again routes that are usually operated by the B7s, so quite a treat for the traveler's on the run today! Though the 24 year old Leyland did struggle and bit. After all these years on Cornish roads she is a bit tired I must say, but still much more comfortable and faster than the B7s, and no I'm not making that up. They just don't make them like they used to! 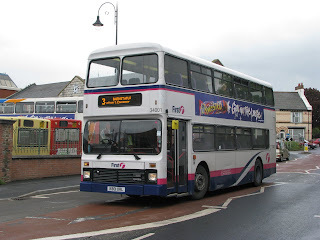 The run back from Redruth (thats as far as I went) was on a B7 and it was just so dull and slow compared to the ride I had had on the Limp. 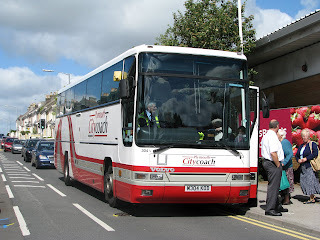 ON return to Truro I made my way towards the coach park. But whats that I could hear! An unmistakeable whine coming from the roundabout, and sure enough, YRC 125M swung round onto the road! The grabbed the camera and took some pictures frantically before it was gone. But there was no worry. The driver pulled over and said "So your a bus spotter then hey! Hop on and come for a ride if you like". What luck I thought! Was a superb driver both in character and in skill and the trip was fantastic. Was also interesting to hear that there have been many offers to buy the bus in recent months, though the owner has been reluctant to sell because of the reliablility and sutibilility of this fine Series 2 Bristol VR. The turning point in Malpas looks even tighter when your actually there, though life wasn't made and easier for the driver because of a parked car where we should have been able to swing the VR round. Though after a couple of attempts we slotted in nicely. The return trip back to Plymouth was fairly uneventful. Though for the last leg on the Vario, we had Mr Cuff at the wheel, showing off his new loud speaker! Was great to have him back for the day, and shame we now have to wait another 2 weeks for this experience. Last week saw A-line/Carmel driver Derrick Cuff leave the bus industry full time to take up a job as a van driver at Brown's Food Service's in Exeter. 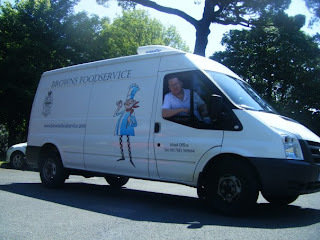 Picture shows him at work in his '08' Ford Transit van. But don't worry he'll be at A-Line every 2 weeks on a Friday. To see the 2nd tribute video and Cuffy's funny moments please visit the links below. Yesterday saw quite a turn out of interesting coaches at Bretonside. 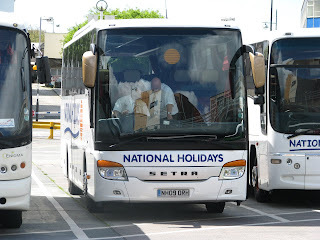 First was this brand new '09' plate National Holiday's liveried Setra this being NH09 ORH. 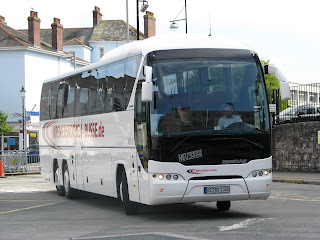 I think I'm right in saying that this must have been the new fleet's first trip to Plymouth, as the 45 new coaches only arrived last week. Though if I'm honest at the time I didn't even notice it was a brand new coach! It blended in a bit too well with the other 3 National Holiday coaches there, all vintage compared to this. 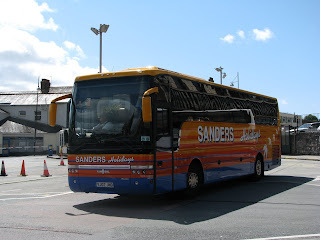 Next was this brightly liveried Van Hool bodied VDL, from Sanders holidays. This brought a great viberence into the sea of white that was in the bus station before this arrived! 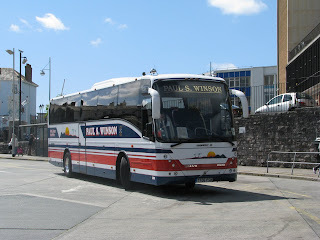 Next was this Volvo B12B, from Paul S Winson. This again was a very smartly painted bus, with the nice American style horns on top this really did look the part! One of the nicest liveries I've seen for a long time in my opinion. Excluding the Van Hool 5 minutes before! And lastly was this tri axle Neoplan, from Germany. This was a change from the normal British coaches that crowd the bus station. 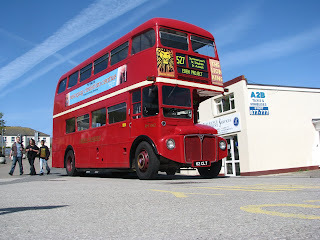 The Torbay/Paignton sightseeing Daimler Fleetline, JTD 395P was seen today at Plymouth Citybus, likely in for a MOT before the new season starts. 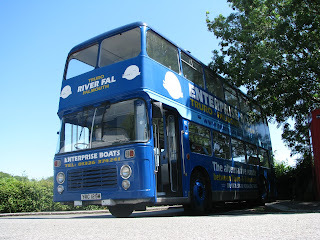 She was seen in service on the Torbay football celebration route where the team rode on top of her through Torbay. Though this was last week. Just to summarise a trip to Barnstaple last week I was amazed at how interesting the little town was. 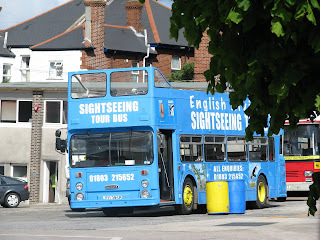 Plenty of variety, a few odd things, and the star of the show K801 ORL which is one of the buses likely to join Torpoint in the near future. 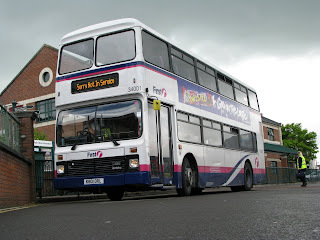 The Trident's sisters were also seen operating 1 and 2. There was also one of the P reg batch of Darts. Along with a healthy dose of Optares including Solos and Versas. Just a bit nicer than a load of Darts! Might need to go back and have a ride over the holidays! This week's Snap On Sunday is of one of the 'new' Dennis Tridents re-registered HIG 1533 fleet no 42879. 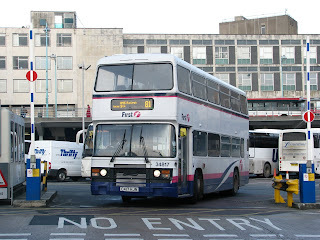 This bus was previously registered T879KLF while working for First in London. 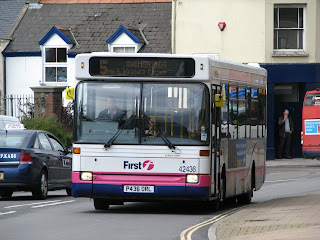 This bus is currently at work at Callington. 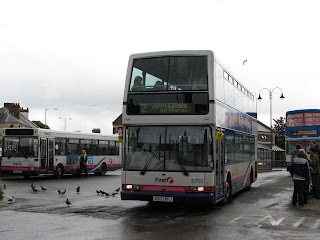 This has been the replacement for K802 ORL at Callinton and therefore K802 should be a bit more of a permanent sight at Torpoint. Taken yesterday on my bashing session is C417 HJN, 34817 seen coming up from Fourlanesend at Maker. All buses now use this road and don't go round Anderton. This is with the exception of the school bus which is always run by one of the 4 Olympians. 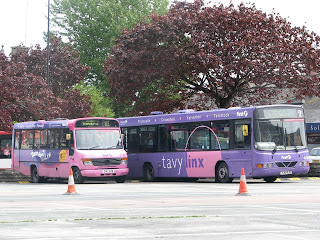 The first picture here shows Target Travel's Optare Solo W676 DDN, with Pink Limos for you Optare Alero B13 PNK bringing up the rear. It amazed me how similar one of these sounds so an Iveco Daily van!! 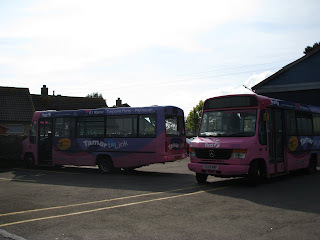 Second picture of Tamar Link Mercedes Vario S412 GUB alongside TavyLinx WJ51RJO in Bretonside. This weeks picture is a bit of a blast from the past really. 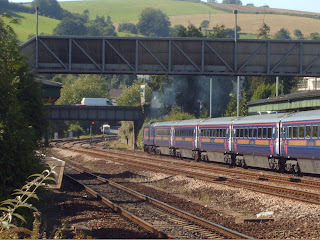 Seen here is a Class 43 set in Totnes when the MTU engined 43s were interesting!! 43174 is seen here in the new livery having been MTUed pulling a rake of old livery carridges along with 43170 at the rear seen with her clagging Valenta in the picture below! Don't we miss these days! To save me writing about my day yesterday at the Western Greyhound event most of this post will be copied from what I sent to BBC Radio Devon yesterday evening, to David Shepards late night program. This story is from just today when I was off to the Western Greyhound heritage day. 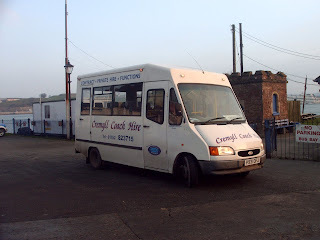 The day started off with me waiting for my 81C in Cawsand. I was there in plenty of time as its usually early. 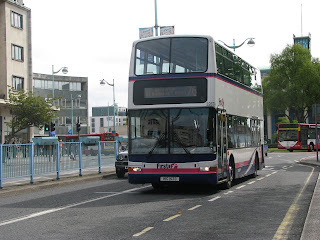 It was a tight schedule into Plymouth to get my connecting bus, but just as buses always do, when you most need them, they fail. Dennis Dart 40002 driven by Gerald turned up 20 minutes late! He was in no rush though and we missed our ferry. Luckily the Western Greyhound was also running late and I managed to catch it! Though this was with incident in that he didn't believe I was under 16, so this took a couple of minutes to convince him of this. It went smoothly from there until St Columb Major where my connection to Newquay left a couple of minutes late. No worry I thought I have 15 minutes of buffer time in Newquay. Though amazingly I don't know how but by the time we were entering Newquay we were the 15 vital minutes behind time! I was very on edge and as we navigated through the town, things were only set to get worse. 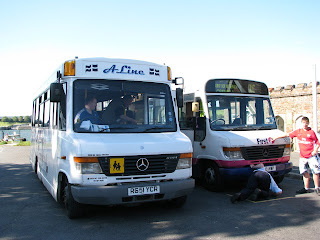 We reached Newquay bus station at 11:06, we were pulling into the stop just as the standing Bristol VR put his indicator on! The driver of our bus was not happy with his parking and he went for another attempt. I said to him "Hold that VR, that's my bus!" He took no notice and proceeded with his perfect parking as the VR pulled away without its costumer! An eventful 4 hour journey wasted! The driver was not helpful after this when I asked him "Is there anyway I can chase it" to which he replied "No". I therefore waited until the next bus following the VR 1 hour behind. I asked the driver to let me off where the crossover point is so I could swap to the VR. This happened to be in the middle of no where, miles from any village. After 20minutes the VR still hadn't turned up. And well for the next 1 hour 30 minutes there was no sign of a VR whatsoever!! All that happened was the Vario I had got there on came back! The VR had died on route leaving me stranded for that length of time. Combined with the journey to 'nowhere' this was 3 and a half hours wasted. By which time it was time for my bus back to Plymouth to depart!! Though the journey back was 'smooth' this was not the case in the literal meaning. 3 more hours on a Vario did no good for my backside and was, for the first time ever, pleased to be on a Trident on the way back to Cawsand. 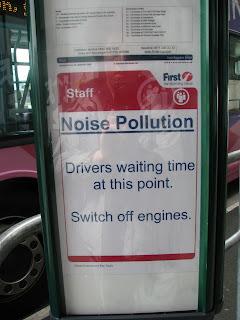 A complete and utter waste of time, buses these days!! A total of 9 Varios traveled on by myself today! Never again!!! !